[post_content] => The SFS Centre for Rainforest Studies faculty and staff left our tropical home on the Atherton Tablelands to greet twenty-six new students in Auckland at the beginning of New Zealand’s winter. The mild maritime climate had us layering, but not shivering. We began the four week program at Huia Bay, about an hour’s drive from Auckland, New Zealand’s largest city. The bay, in all its moods, gave us an artist’s palette of colours each day, making the students’ long flight from the States worth the journey. Students spent the first several days of the program becoming familiar with New Zealand’s unique ecology (flightless birds, no native mammals, and frogs that do not have a tadpole stage, to give a few examples) and history through lectures, hikes in the surrounding forest, and cultural exploration at the Auckland War Memorial Museum. We spent our evenings drinking cuppas and practicing singing “G’day, G’day,” an Australian classic by Slim Dusty, and “This Land is Your Land,” an American folk song by Woody Guthrie, to the tune of our multi-talented cook Iris’s guitar chords. These songs were then performed for the Prime family upon our arrival at the Marae for our Maori homestay. While in Australia, our Student of the Day is called the “Wompoo,” named for a fruit pigeon common at the Centre. However, for the New Zealand portion of our program, we have adjusted this title to the “Kakapo,” a large, flightless, nocturnal parrot endemic to New Zealand. Our Kakapo of the day, Marissa Silvi, spoke on behalf of the student group, thanking the Prime family for hosting us and welcoming us to their beautiful country. We sang our songs in response to their beautiful Maori songs, and we spent the evening near the woodstove, introducing ourselves. The rest of our homestay included walks through the forest, learning about traditional uses of plants; delicious meals; time by the fireside to ask questions about Maori culture; and a visit to the Waitangi Treaty house and the historic battlefield at Ruapekapeka Pa. Students were touched by the Prime family’s offer to welcome us back to their home if we ever visit New Zealand again. When we left, in Maori tradition, we did the “hongi,” pressing noses and foreheads together, as we did when we arrived. Our next stop was to volunteer with CUE Haven; “CUE” stands for Cultivating, Understanding, and Enlightenment. 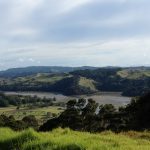 Founders Tom and Mahrukh purchased the CUE Haven property, which had previously been a dairy farm, to return it to native bush. When the planting project is finished, Tom and Mahrukh will open the property to the public as a park. We spent a day and a half helping out by planting native New Zealand trees, building a boardwalk, and maintaining an existing track. You can see photos and read more about our experience here: (cuehaven.com/2014/06/14/sfs-centre-for-rainforest-studies-11-12-june-2014). When the students arrive in Australia, they will see the trees that have been planted on our own property and have the opportunity to volunteer at TREAT, the local nursery, to see other stages of the tree planting process, thereby having a hand in forest regeneration in both New Zealand and Australia. After cleaning our muddy boots, we got in the vans to return to Auckland, where we spent a day at the Auckland Zoo. Here, we got to see some New Zealand animals that we did not see in the wild, such as the elusive kiwi, New Zealand’s national icon, and the tuatara, an endemic reptile which evolved more than 200 million years ago. Before heading to the airport to return to Australia, students had a free weekend in Auckland, where they enjoyed visits to Hobbiton, the set of The Lord of the Rings movies; the Waitomo Glowworm Caves; Tiri Tiri Matangi, a reforested island that has become a home to many of New Zealand’s threatened birds; and Waiheke Island for wine tours. Some students were even daring enough to go bungee jumping in Auckland on their day off, but everyone has now made it safely and happily to the Atherton Tablelands for part two of their experience! [post_excerpt] => The SFS Centre for Rainforest Studies faculty and staff left our tropical home on the Atherton Tablelands to greet 26 new students in Auckland. The SFS Centre for Rainforest Studies faculty and staff left our tropical home on the Atherton Tablelands to greet twenty-six new students in Auckland at the beginning of New Zealand’s winter. The mild maritime climate had us layering, but not shivering. We began the four week program at Huia Bay, about an hour’s drive from Auckland, New Zealand’s largest city. The bay, in all its moods, gave us an artist’s palette of colours each day, making the students’ long flight from the States worth the journey. Students spent the first several days of the program becoming familiar with New Zealand’s unique ecology (flightless birds, no native mammals, and frogs that do not have a tadpole stage, to give a few examples) and history through lectures, hikes in the surrounding forest, and cultural exploration at the Auckland War Memorial Museum. We spent our evenings drinking cuppas and practicing singing “G’day, G’day,” an Australian classic by Slim Dusty, and “This Land is Your Land,” an American folk song by Woody Guthrie, to the tune of our multi-talented cook Iris’s guitar chords. These songs were then performed for the Prime family upon our arrival at the Marae for our Maori homestay.